Litronic, is an ISO 9001:2008 certified provider of secure identity management and information assurance products for the government and commercial markets. By facilitating the deployment, management and use of digital certificates and smart cards, Litronic's products provide high assurance solutions that help organizations achieve their physical and network security goals. Litronic has FORTEZZA reader solutions that are Microsoft Certified for both desktop and server applications. Desktop readers can be ordered in external or internal configurations. All FORTEZZA readers are Plug 'n' Play compliant for easy installation. 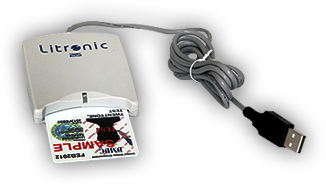 Litronic has Microsoft Certified smart card reader solutions for CAC desktop and HSPD-12 environments. Smart card readers can be ordered in external or internal configurations and all readers are Plug 'n' Play compliant for easy installation. To purchase a reader, please visit our store. For large orders, contact us. Litronic has over 30 years of experience contracting to commercial and government markets from research, planning and prototyping solutions to the manufacturing and assembly of secure systems. Let us help you with the solution that will bring your product to market. The 215 Reader has been designed with 32 and 64 bit operating system standards for Microsoft Windows 7, Vista, XP, 2008 and 2003 Server. The Reader is a USB 2.0 smart card device that is Plug 'n' Play compliant and requires a minimum of effort for successful installation.